With their superb performance, NorthEast United FC who powered ahead in the first half with two early goals and backed it up with committed and organised defence to inflict a 2-0 defeat on Mumbai City FC in their ISL fixture on Wednesday. India international player Rowllin Borges and Nigerian striker Bartholomew Ogbeche were on target as NEUFC’s seventh win in 16 games took it to the second spot of this season’s ISL. A match report by The Hindu stated Mumbai City FC slipped to third, level on points, goal difference and goals scored (27, +4, 21) with NEUFC. Its head-to-head saw the North-East side move to No. 2. It has been reported that the two goals earned by NEUFC happened partly due to first-time shots on target and partly due to sluggish defending. Keegan Pereira burst down the left and changed the point of attack with a deft tap and Borges connected at first touch, finding the roof with a crisp right-footer past a diving Amrinder Singh, the report says. In the second half, the Mumbai City FC goalkeeper found himself helpless when the ball rolled. This time, Reagen Singh did the damage from the right flank with a relay into the goalmouth for Ogbeche to deflect home with ease as no defender was at hand to hustle him. At the other end, it was Pawan Kumar who had faced a similar situation when Marko Klisura slipped into space near the NEUFC goal to trap an airborne pass, but the ball struck the player’s leg and bounced out of range. 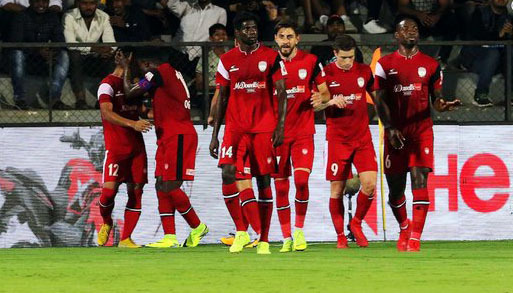 The Mumbai City FC were punished by the NEUFC in the fourth minute after yielding space on the left flank and allowing Borges the time and space to strike. Central defender Lucian’s absence was clearly felt — he was out with yellow cards — as his replacement, Klisura took time to adjust in the game. Rafael got the equaliser for Mumbai, arriving at the right place to direct a pass back goalwards. The ball whizzed away from Pawan Kumar onto the crossbar and bounced away, leaving the Brazilian holding his head in anguish. A goal would have been just reward for team effort, but instead of being on level terms, Mumbai City FC leaked a second. On resumption of the game, Mumbai City FC stepped up the pace and created chances, but the sharpness in finishing seen in earlier games was missing. Arnold Issoko got into position for a header off a Bastos pass, but was ruled offside while Klisure moved from defence to attack and got to the business-end of a Rayner Fernandes pass before losing the ball.